"My interpretation of a spicy Caribbean side dish served at a legendary Jamaican restaurant in my town. I like to serve this with a full Caribbean-style meal of Jerk Chicken, Jamaican Rice and Peas, Fried Plantain and cornbread." Pour the water into a large pot. Separate cabbage into leaves, and place in a steamer basket. Set the basket into the pot with the water. 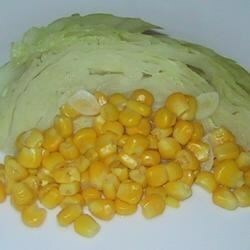 Bring to a boil over medium heat, and place the ear of corn over the cabbage. Cover, and steam for 15 to 20 minutes, or until corn is tender. Remove the basket from the pot, and cool slightly. Cut the ear of corn into four pieces and place them in a serving bowl with the cabbage. Combine the butter, vermouth, shallots, garlic, salt, pepper and red pepper flakes; pour over the cabbage, and stir to coat evenly. Separate the salad onto four plates, and garnish each one with a piece of the corn. Not much to this dish. It wasn't bad, there just wasn't much flavor to this dish. This was real easy and very tasty. I used corn off the cob and slightly less butter. I used Chardonnay. Also, I melted the sauce in the microwave.